Within the last ten years or so, stand up paddleboarding, or SUP has become one of the UK’s fastest growing water sports, with clubs, classes and guided tours happening all over the country. If you have moved passed the beginners stage and want to set off in search of some fantastic SUP locations, we have put together the top six to check out. Get yourself one of our quality SUP’s and any accessories you need if you haven’t a board of your own so you can head off for a last minute SUP trip! Burgh Island in South Devon is an icon of the south coast of England, located opposite Bigbury on Sea, and was once a hot spot for pirates and smugglers. The island is separated by a sandy tidal beach from the mainland and can be accessed by foot at low tide. However, the waters around the island are ideal for SUP, and you can get close to explore the small coves and caves as you circle the island, which takes around one hour. The best time to visit is during the summer, as waters are calmer, and you can reward yourself with a refreshing pint at The Pilchard Inn, a 14th century pub on the island afterwards. The miles of waterways that make up the Broads are perfect for water sports, and you are sure to come across several fellow paddlers as you traverse the waterways here. SUP is a great way to explore the hidden treasures of the Broads up close, including the diverse range of wildlife that has made it their home. If you choose to paddle on the Broads, either in Norfolk or neighbouring Suffolk, you need a licence, available from The Broads Authority. Elsewhere around Norfolk, SUP is popular on the beaches, particularly the flat water at Hunstanton. The lakes and rivers in the Lake District in Cumbria are perfect for SUP, but one of our favourites is Ullswater. The second longest lake in the District makes it ideal for a big lake paddle as a group, and there are some great cliffs around the lake for cliff jumping too! Southwesterly winds that funnel down the lake, which is only 1km at its widest point, are perfect for downwinders. There is also a water taxi on Ullswater, so you can paddle the length of the lake, deflate your inflatable SUP boards, and hop on the taxi to go back to your car. Pembrokeshire National Park coastline is a fantastic place to SUP. The gorgeous scenery combined with sandy beaches, clear waters and array of wildlife means you can easily enjoy a day out on your SUP board. The sheltered stretch of coastline between Barafundle Bay and Stackpole Quay is a particular favourite, as there is a chance of seeing dolphins, porpoises and basking sharks if you’re lucky! If you are unsure of where to go, you can join a guided tour that takes you past the cliffs and coves along the coast. Have a trek over the Isle of Mull in the Inner Hebrides. This small island is a great place for an adventure holiday off the beaten track, with camping and SUP to while away your time. There are 300 miles of unexplored coastline, and wildlife on land and in the sea to spot. The remoteness of the Isle of Mull may put you off, as you need to bring all your own supplies with you, but once you get there, you will reap the rewards. 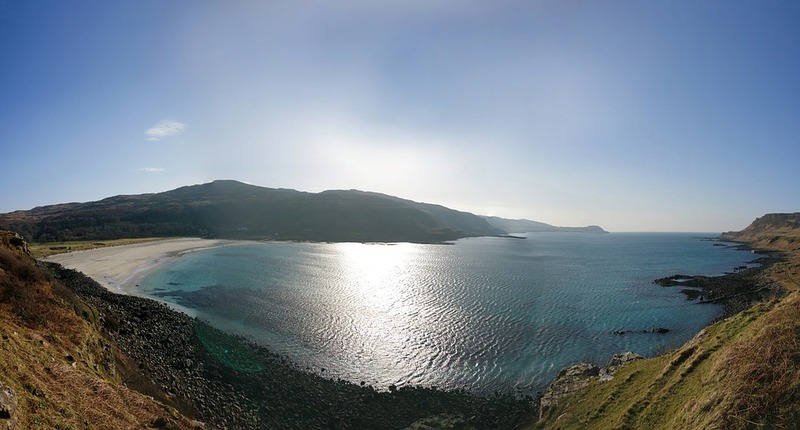 The best time to visit is throughout the summer, from May to September, and the turquoise waters around Mull will put it at the top of your list for SUP in the UK. The calm water of the large inlet in County Down, Northern Ireland is the perfect place for people looking for flatwater paddling and downwinders. You pass by several small islands and the countryside around you. The southwest corner has lots of great paddle destinations such as Salt Island Bothy, and if you start at the southeast end, you can use the wind to guide you through the inlet and see the algae forest below. From the southeast end to the northern end of Strangford Lough, the journey takes a few hours. Are there any places you love to paddleboard around the UK? Let us know via our social media channels!